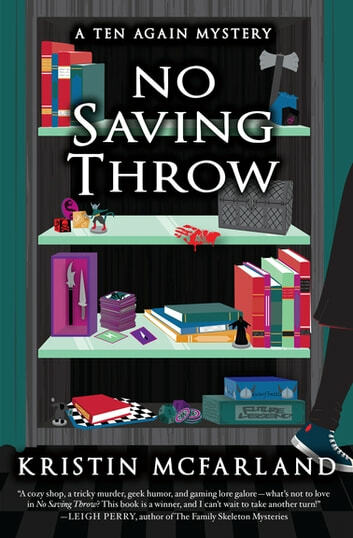 “A cozy shop, a tricky murder, geek humor, and gaming lore galore―what’s not to love in No Saving Throw? This book is a winner” (Leigh Perry, author of The Family Skeleton Mysteries). Autumn Sinclair has everything she could possibly want: Loving friends, a successful business, and a gaggle of gamers in her store every day. Welcome to Ten Again, a tabletop gaming store that attracts nerds of every kind and fosters a community Autumn’s pretty proud of—a community that also keeps business afloat. And now that she’s in the running for a grant, Ten Again’s future is looking bright. That is, until one of Autumn’s gamers is mysteriously murdered. With everyone in the mall as a suspect and accusations flying, Autumn is going to have to do some sleuthing of her own to save her shop and her gamers from a fate more dangerous than having no saving throw.